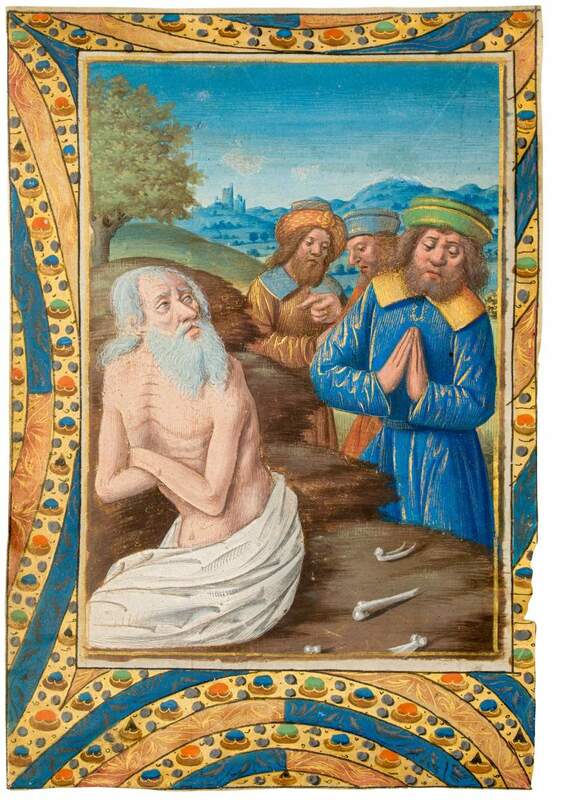 Leaf from a Book of Hours with a full-page miniature, opening the Office of the Dead. This miniature leaf comes from a Book of Hours and originally would have opened the Office of the Dead. The representation of Job on the dunghill in this context serves as a type of author’s portrait. The nine readings that are integral parts of the nocturnes of the Office of the Dead come from the biblical Book of Job. The arrangement and style of the miniature point to the workshop of one of Tours’ most important painters and illuminators Jean Bourdichon (1457-1521). He developed his own artistic nomenclature and, in his later artistic career, he famously invented the so-called ‘dramatic close-up’, a method of zooming in on the protagonists, a technique which is also applied in the painting at hand. Judging from the considerable number of works that are still extant, Bourdichon must have employed a large number of collaborators. One of them was certainly responsible for our miniature, which deviates from the master’s personal style by displaying stronger, chiselled facial features and being more cautious in using gold highlights.